Give me the Healthy Fats! When I was in high school, I unfortunately got caught up in the hype of trying to be thin. I was extremely active (played soccer, ran track and cheered competitively), yet I had little knowledge about how to properly fuel my body. Like most teenagers, I had a sweet tooth and loved my Snickers bars and Reeses, but thought that I could somehow compensate by drinking Diet Coke and restricting my fat intake. I would have salads for lunch but skip the meat and do very little cheese with no dressing. I would eat low-fat protein bars or fat-free crackers thinking that I was doing well. I feared butter, avocado, olive oil, red meat, etc. All of the girls on my cheerleading squad did the same thing, so I thought I was “normal.” My performance in sports suffered because I was constantly tired and hungry. I suffered from hypoglycemic episodes because I wasn’t consuming any fat to help stabilize my blood sugar. It wasn’t until embarking on my degree in Nutrition, Dietetics, and Food Science, that I began to realize what my body had been missing out on. Instead of being surrounded by girls drinking diet coke and eating bland salads, my peers brought nuts and topped their toast with avocado. These women didn’t count calories or skimp of what they loved and still they were some of the most in-shape people that I knew. –Listening to their body and giving it the nutrients that it needed! I quickly learned to “Eat Like a Dietitian,” and never felt better. My energy levels improved, my sugar cravings went away, my blood sugar stabilized, I wasn’t hungry all the time, my skin glowed, AND I got to enjoy the wonderful flavor that healthy fats provide! The medical and nutrition recommendations used to point towards low-fat foods, but recent research has shifted and points to the nutritional benefits of incorporating healthy fats into our diet. Studies show that when healthy fats was replaced with sugar and salt, incidence of Diabetes and Cardiovascular disease and Obesity increased. Let’s discuss of healthy fats that you should be eating. More and more, research is revealing that dairy fat isn’t harmful to heart health as once thought. In fact, it may be beneficial. Phytanic acid, one of the fatty acids in dairy fat, has been shown to reduce triglycerides, improve insulin sensitivity, and improve blood-sugar regulation in animal models. Another study of 2,600 U.S. adults found that, trans palmitoleic acid from dairy, was associated with lower triglycerides, lower fasting insulin, lower blood pressure, and a lower risk of diabetes. Additionally, Conjugated linolenic acid (CLA), a natural trans fat also found in dairy products, may reduce the risk of heart disease, cancer, and diabetes and assist with weight loss. Finally, dairy fat is also a good source of fat-soluble vitamins like retinol (active vitamin A) and vitamin K2, which are difficult to obtain elsewhere in the diet. add 1/4th to ½ cup whole milk to your morning coffee to minimize the jitters from the caffeine. It’s creamy, packed with nutrients, and will satisfy. Avocados are filled with healthy monounsaturated fats that contain oleic acid, which can actually help quiet feelings of hunger. A study in the Journal of Nutrition showed that when participants added approximately one-half of a fresh avocado to their lunch they felt more satisfied and had less desire to eat following the meal. Moreover, the patients also had a lower immediate rise in insulin levels than when the same lunch was eaten without the avocado. I tried this myself and have never gone back. In fact, I add 1/4th an avocado do my breakfast, ½ avocado to lunch and ½ avocado to dinner to keep me fueled! Another benefit of avocado is that it provides protein and fiber. Experiment on yourself and see if adding ½ of an avocado to your lunch keeps you satisfied longer. Most people know that eggs are a great source protein, but did you know that they’re also the number-one dietary source of choline? Choline attacks the gene mechanism that triggers your body to store fat around your liver. Don’t worry about eggs contributing to high cholesterol — In the past, dietary cholesterol was considered to be something that could increase the risk of conditions such as coronary heart disease. The problem was that dietary cholesterol is, more often than not, found in foods that contain high levels of saturated fats. According to Medical News Today, more extensive research has managed to separate the effects of dietary cholesterol and saturated fat and found that dietary cholesterol increases the levels of both LDL cholesterol and HDL cholesterol (also known as “good” cholesterol). The changes were also small in comparison with those instigated by saturated fat. Aside from this, the increase made to good cholesterol levels balances out the increasing levels of bad cholesterol. As eggs are low in saturated fats, the effect that they have on blood cholesterol is deemed to be clinically insignificant. Instead of a sugary granola bar that will leave you wanting more, try having 1-2 harboiled eggs sprinkled with salt and pepper or make a healthy egg-salad using plain greek yogurt instead of mayo for an afternoon snack. Many associate beef with increased risk of heart disease. There is a difference between Grass-fed and conventially raised beef. Grass-fed beef generally comes from cattle that eat only grass and other foraged foods throughout their lives while conventional beef cattle eat a diet that includes grains, such as corn. This difference in the diets of the cattle actually changes the nutrients and fats you get from eating the different types of beef. Grass-fed beef may have some heart-health benefits that other types of beef don’t have such as containing higher concentrations of omega-3 fatty acids, conjugated linoleic acid (CLA),antioxidants, and vitamins, such as vitamin E. If price is an issue, you can make a little go a long way by adding fiber-rich black beans to the beef in a hearty taco salad or fajitas. Don’t be tricked into purchasing “low-fat” varieties in effort to save your waistline. Low-fat versions replace the healthy fats with salt, sugar and usually contain partially hydrogenated oils. I know sometimes PB Powders can be tempting. The flavor without the fat? The problem is—this fat is healthy! Research shows an inverse relationship between nut consumption and BMI or weight gain. In data collected from 2005-2010, National Health and Nutrition Examination Survey (NHANES) revealed that individuals who ate at least 1/4th of a cup (a 1oz serving) or nuts per day had a lower waist circumference, BMI and overall weight than those who didn’t consume nuts. The nuts provide satisfying fat, protein, and fiber so you are satisfied with one serving and will be less inclined to keep reaching for snacks. 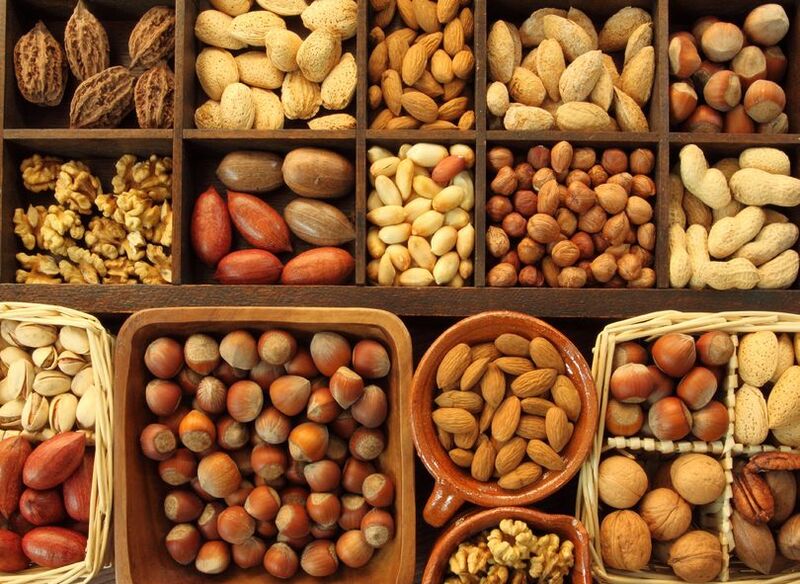 Moreover, clinical trials show that nut consumption reduces risk of Cardiovascular Disease, Type II Diabetes and help prevent insulin resistance among many other health benefits. It is important to consume proper portion size which is 2 tbsp of nut/seed butter or 1/4th cup of nuts. Add some to your morning smoothie or oatmeal and you’ll be satisfied until lunch! The key to incorporating healthy fats into your diet is to replace “empty” calorie, non-nutritive foods. When you eat a meal, you want to feel satisfied, not left with hunger pangs or cravings for sweets. Most “diets” lead to intense cravings and/or food binges because your body isn’t getting the nutrients that it needs. Healthy fats stick to your bones and help stave off cravings for foods that with only spike your blood sugar, promote insulin production and thus increase fat storage. These healthy fats help your body absorb fat-soluble vitamins (A, D, E, K), provide essential fatty acids, assist in recovery from strenuous exercise, help with cognitive function and also aid in hormone production. You need Healthy Fats to survive! Eat like a Dietitian!